Toys suddenly developing intelligence. A mystical mummy roaming the beaches. Weird events in the local video store. A mixtape full of mysteries. Four wondrous machines. A guide to creating your own setting for the game. 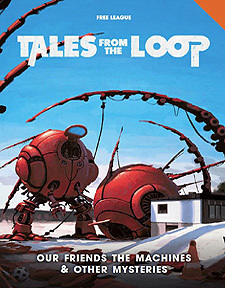 All of this and more is included in this volume, the first official module for the multiple award-winning Tales from the Loop RPG. Horror Movie Mayhem. The '80s was the decade of moral panic, when everything new was dangerous and corrupting. In this mystery the Kids will investigate what is really happening in and around the local video store. The Mummy in the Mist. There are whispering rumours that it is back again. The mummy down by the lake. Roaming the beaches by night, looking for something, hungering after something. It will be up to the Kids to solve this mystery. Hometown Hack. A guide to creating your very own setting for the game, complete with the Norfolk Broads, a UK-based Loop.